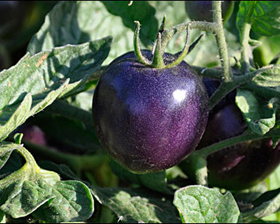 The "Indigo Rose" tomato is the first "really" BLUE tomato variety to come from a program at Oregon State University, developed by Jim Myers. It is the first improved tomato variety in the world that has anthocyanins in its fruit. 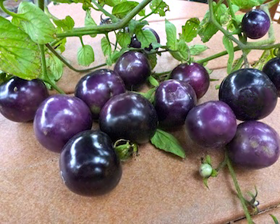 If you want a really, really purple tomato that can be as black as an eggplant, give Indigo Rose a try. 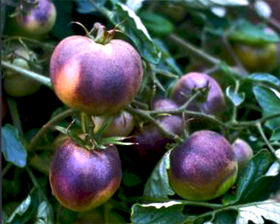 The tomatoes will be purple where exposed to light and they tend to have a purple crown. They are ripe when their color changes from a shiny blue-purple to a dull purple-brown. Tomato Indigo Rose is an open pollinated variety, it is NOT GMO.